Inside this small shop in the historic Cherokee district, guests can grab a tray and choose from the many baked goods offered. Items include croissants, churros, cookies and empanadas. The wall-to-wall shelves are loaded with fresh items throughout the day. Diana's also bakes specialty cakes for all occasions. The bakery is carryout only. 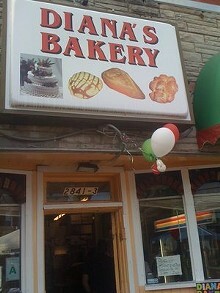 Extra Info: Bakery only. Cash only.